The cross section drawings below show how the Enviromec Weighbridge design of a closed chamber eliminates bending, fatigue, weld failure and is sealed against corrosion. The 15mm steel plates are folded and continuously welded to provide maximum support for the vehicle's wheels. This design makes the weighbridges unique. The stress load with our design, is such that as a vehicle drives onto the weighbridge, the load is spread throughout and not compressing the top plate or tensioning the bottom, which is the main area of fatigue. This is achieved by using sections that are of a trapezoidal shape as you can see above. We have total design and quality control over the concrete deck. 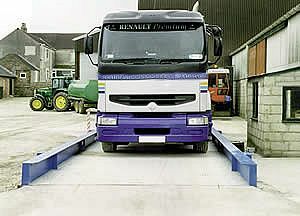 Weighbridges are delivered with load cells, indicator & printer, there are no hidden extra costs and all installation, calibration and stamping (if required for trade use) is included. The weighbridges have Full European Trade Approval. The surface mounted weighbridge is probably the strongest weighbridge available. The deck is made from pre-cast concrete and will never corrode, this can be a major problem with the underneath of competitor's weighbridge decks. Painting and maintenance is virtually removed due to the design that incorporates fibres within the concrete. This makes our weighbridge the ideal choice for siting where corrosive elements such as road salts and chemicals might be transported. The deck does not need any special restraints as impact protection is in built. Standard sizes are 6m x 3m, 8m x 3m, 15m x 3m and 18m x 3m. We can design and build bespoke sizes to your needs. The capacity can be between 30 to 100 tonnes. Heavy Duty Vehicle Weighbridge - Portable Weighbridge.